Naturopathic physicians are trained primary care providers. From ordering imaging and lab work to exploring emotional causes of physical ailments, naturopaths treat the whole person and address the underlying causes of dis-ease. While each visit to Heart Spring Health is as unique as the patient, it is common to have the first visit last between 60-120 minutes. 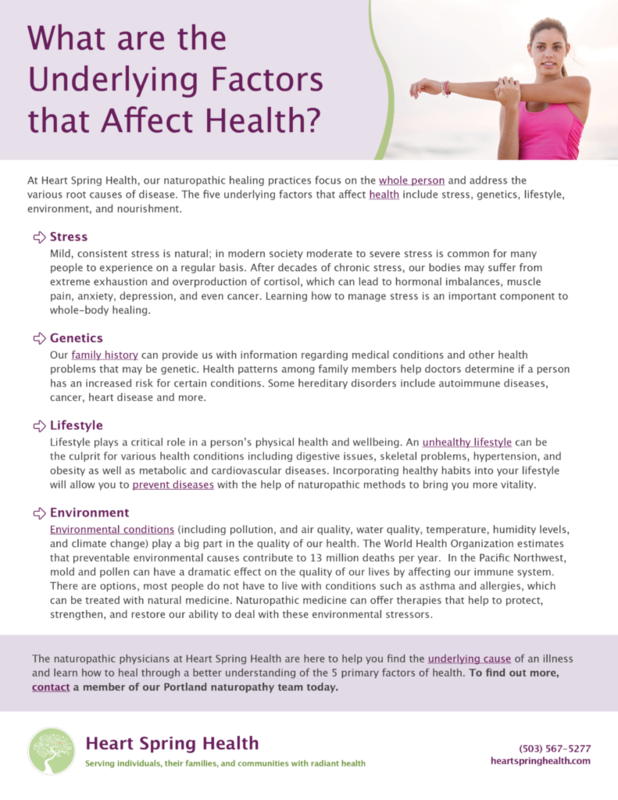 This gives us a chance explore the underlying factors affecting your health. Prior to your visit, we will send you paperwork to complete that includes a thorough health history. When we meet, we will review this together to better understand your concerns. Through physical exam and possibly lab work, your doctor will do a comprehensive analysis of your health that will help inform your personalized treatment plan. Ultimately, the goal of this first visit is to understand your current health challenges, history and goals. You will leave with a clear picture of how we will work together to support you in your return to radiant health. Naturopathic physicians complete a intensive four-year post graduate doctorate program. They are required to complete the same prerequisites required for any type of medical school and to study the same basic and clinical sciences a medical doctor studies, including pharmaceuticals. In addition, a naturopathic doctor studies healing through natural substances such as plants, minerals, water, foods and more. The nature-path teaches patients the path to natural health and healing. Learn more about training here. In addition to the principles Naturopaths follow best treatment practices called the Therapeutic order. Our treatment plans are individualized to take into consideration not just the pathological process that might be present but also the person who is experiencing the symptoms.